Having made my first experiment using marmalade in cakes with this chocolate and marmalade cake and been won over by the result, I decided to have another go. I’ve had my copy of Nigella’s How to be a domestic goddess for many years now and I’ve always skipped over her store cupboard chocolate orange cake because of the use of marmalade. Now don’t get me wrong, I like marmalade – but when it’s on toast. Anyhow, Mother’s Day had arrived and I thought she would especially enjoy a marmalade cake – it was her marmalade after all. So, to Nigella’s recipe I went. I did of course make some inevitable changes – I added yogurt for a start. I also decided to top it with some ganache as it was a special occasion. Melted 125g unsalted butter in a large pan. When butter nearly melted, I turned off the heat and added 100g 85% dark chocolate and left to melt for a few minutes. Stirred until all incorporated and smooth. Added 3 large tbsp of my mother’s marmalade, having first cut up all the big bits into smaller ones. Beat in 2 duck eggs and a pinch of rock salt. Sifted in 150g flour (120g wholemeal spelt, 30g quinoa), 1 tsp baking powder and stirred. Finally stirred in 1 tbsp Greek yogurt. Left to cool for a couple of minutes then turned out on to a wire rack to cool completely. Melted 100g of 70% dark chocolate with 20g unsalted butter and 1 heaped tbsp of marmalade (chunky bits removed) together over a pan of hot water. Stirred together then spread over the top of the cake. Decorated with orange and lemon flavoured sweets (shredded orange would have been a much better decoration and more in keeping with the 100% organic ingredients, but I had no oranges to hand). Well, I have now been completely won over to using marmalade in my baking, this cake was delicious. Luckily my mother thought so too, although she was somewhat surprised by her marmalade coming back to her in a different form. I’m also entering this into this month’s Forever Nigella started by Sarah of Maison Cupcake, but this month hosted by Mardi at Eat, Live, Travel, Write. To tie in with the Royal Wedding and any resulting street parties, the theme is party food. Well surely cake is for sharing and any cake is good for a party. Just gorgeous. I can see why your mother was pleased. I am waiting for my stand mixer to arrive, then I have a marmalade cake I want to try, but it doesn’t have chocolate, I a, afraid. Absolutely we need big stonking cakes at a street party and this looks just the ticket. I am CRAZY about chocolate and orange combos ,they’re one of my favourites! Thanks for taking part! I love this cake and yours turned out gorgeous! I love it! It’s so dark and mysterious looking!… I can simply taste it now, so yummy… I love the really dark ganache too… lucky mum! I bet Mum loved it! Lovely presentation. 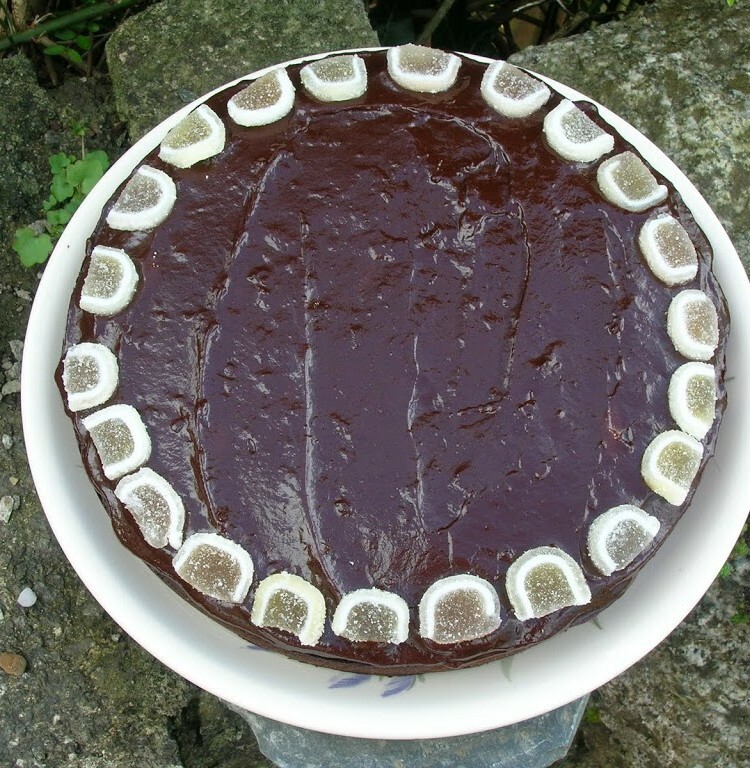 Now you’ve got me at it -I made a carob marmalade cake yesterday with an orange glaze – absolutely delicious as I’m sure yours was..
Ooh it does look lovely. I am glad you are a marmalade cake convert. Mmmmarmalade! I love the stuff. The more tarty the better I say 😉 I’ll bet I’d eat a wedge of this in a flash Choclette, do you think your mum would share? How fabulous that you were able to use your mum’s marmalade in a cake for her! It looks very nice, Choc! Chocolate and marmalade? My hubby would be in heaven! Wha a beautiful looking cake for Mothers’ Day! Thanks for taking part in #forevernigella – it’s shaping up to be quite the party! I’ve not had marmalade and chocolate together before. It looks great. Glad your Mum liked it! What a lovely cake to make for your mother. I always love the use of marmalade in cakes, it’s like adding a mystery ingredient and people can’t quite guess what went into it! I love this cake – I’ve made it quite a few times, and also tried different conserves in it. I think it needs the bitterness of the marmalade though – my blackcurrant jam version wasn’t as good. Yours looks fab and I love the icing topping. I use marmalade for glaze on so many desserts, especially chocolate ones. I have to make this. Sounds just right for us. C – It’s interesting that bitterness often seems to go with bitterness – it’s like tea and chocolate working well together too. Bizzy – it is a good one. So how do you make your glaze? This blog is related shopping. New ideas, quality designs, sensible colors, and no-nonsense prices. I want to like the bag, but something is keeping me from liking it. Unfortunate because I own so many of his bags. This is really nice blog. Marmalade with chocolate is such a nice idea. I thought I had baked most of NL’s cakes but this one has passed me by. Better get to it! Sally – I just find it completely astonishing that the more I bake, the more I find there is to bake! I started to cook my way through How to be a domestic goddess about 11 years ago and only got as far as the first 6 cakes in the book (have managed quite a few more subsequently)! WLM – thanks for visiting. Orange and chocolate are one of the great pairings.